Every art historian working on illuminated manuscripts can list a few books that are important marks on the timeline of medieval manuscripts’ history. One of such examples, at least until recently, has been so called Rabbula Gospels (Florence, Bibliotheca Laurenziana). Apparently even the most famous work of art may turn out to be something else than everyone assumed. Gospels is a book containing only Gospels, so it is not the entire New Testament. Gospel Books were extremely popular in the first millennium AD and they were usually decorated with the images of four Evangelists writing. Every Book of Gospels started with the Canon Tables (also decorated); they were the tables that collected parallel readings of each Gospel. Beautifully decorated Canon Tables are also included in the Rabbula Gospels. The name of this manuscript derives from the name of a scribe, who wrote the book: it was monk Rabbula, who completed this manuscript in in 586 at Monastery of St. John of Zagba, which is mentioned in the note in the text (I have once written about scribes, colophons and other notes, the post is available HERE). But does this precise dating refer to the completion of the decoration of this manuscript, or only of its text? 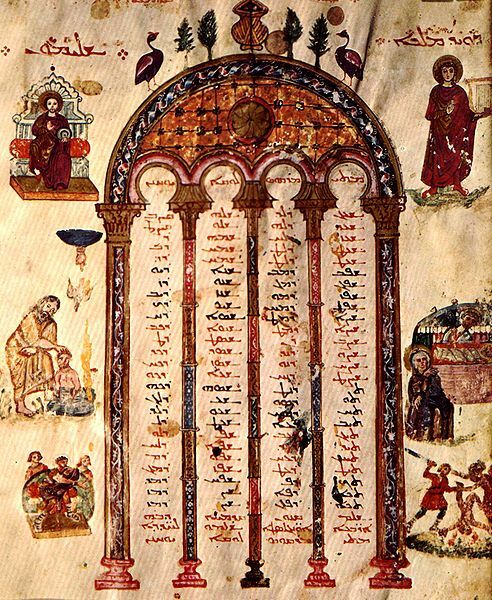 Rabbula Gospels is Syriac manuscript: it is Peshitta, that is a common Syriac translation of the Bible, created probably as early as 2nd century AD. 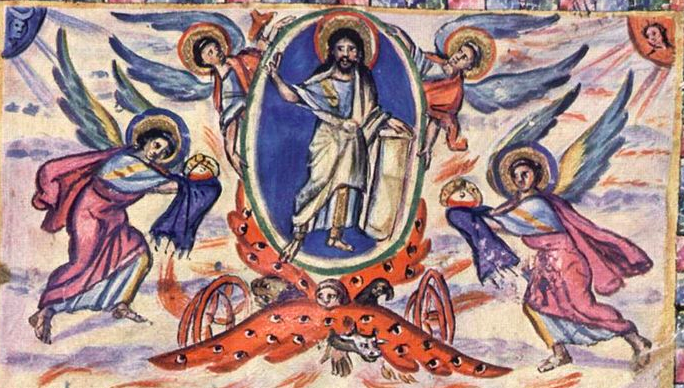 Syria was one of the most important centres of the Early-Christianity and Syriac monasteries in the 6th century produced many fabulous illuminated Christian manuscripts, decorated in ancient Roman-Greek artistic traditions. 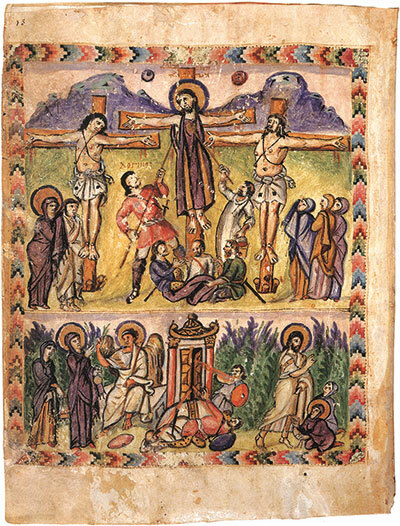 Rabbula Gospels contains 7 full-page miniatures. One of the most famous ones is Crucifixion and Resurrection. 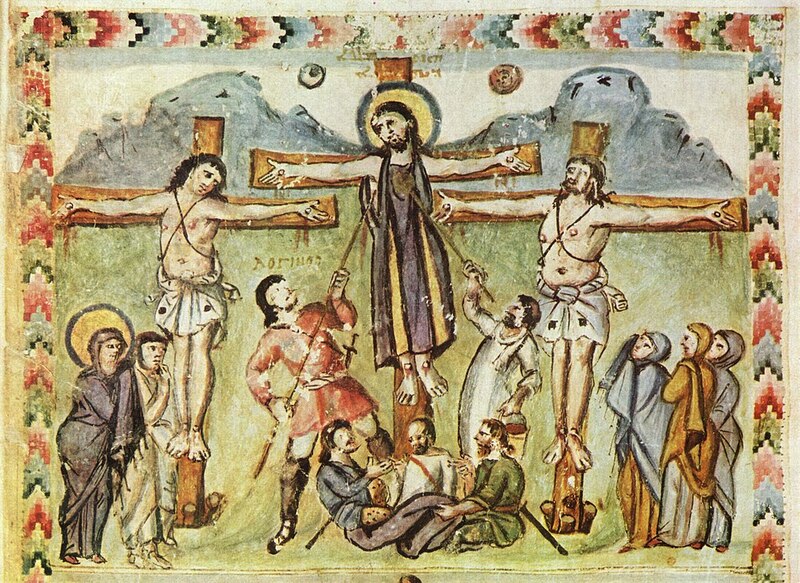 Crucifixion of Christ was not a popular scene in Early-Christian art. Only few examples survived, and this one is valued as one of the best. It is skillfully painted, with mountains in the background; one may see three crosses, three Marys on one side, and Virgin with St John on the other. In the middle we may see the soldiers playing dice for Christ’s robe. Christ is getting vinegar on a sponge and his side is being pierced. According to early Christian tradition, Christ is wearing a long robe (colobium) and he has no crown of thorns. The two balls in the sky are the Sun and the Moon. The most interesting though is the bottom part of this miniature: after the Good Friday we get tot the Easter morning. There is no image of Christ stepping out of his tomb, as such images of Resurrection did not occur in European art until the 13th century. Earlier the artists just stuck to the txt of the Gospel, which do not describe the moment of the Resurrection, but only tell about Marys visiting the tomb and meeting an angel. In case of the miniature in Rabbula Gospels the artist followed the Gospels of St Matthew: only that Evangelist wrote about two Marys (not three) and mentioned Christ appearing to both of them. And what is going on between those scenes? Well, that is an actual Resurrection: light from the tomb (behind the doors) simply knocks down the soldiers! And now it turned out that those marvelous miniatures can no longer be dated to 586… as according to the research published by Massimo Bernabò, the miniatures of Rabbula Gospels come form another manuscript (or manuscripts) and they have been added to this book in the 15th century! The miniatures present uneven artistic quality, they have been partly repainted and trimmed, and most of all: some of them do not derive from the Gospels Book! 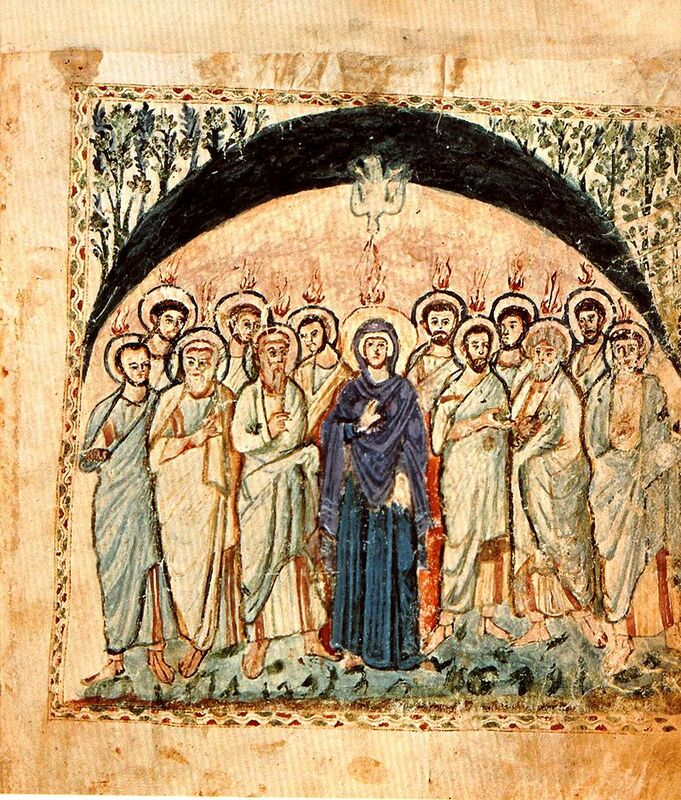 Such images as Pentecost or Election of the Apostle Matthias illustrate events from the Act of Apostles, not from the Gospels, so most likely they originally decorated a manuscript of the New Testament. Rabbula Gospels no longer can be regarded as a precisely dated illuminated manuscript, although its miniatures are probably Syriac anyway, and dating back to the 6th century. Sometimes the most famous art-pieces are not researched properly for a long time, in spite of (and maybe because of?) their fame. And then suddenly it turns out that they are not what they seem to have been for so many years. But does it make them less beautiful? 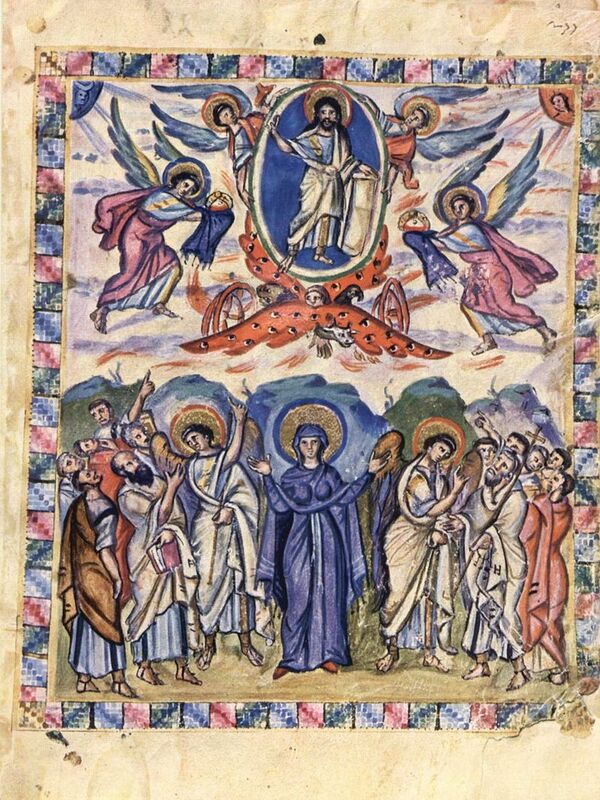 A new publication on Rabbula Gospels mentioned in this post is: Il Tetravangelo di Rabbula. Firenze, Biblioteca Medicea Laurenziana, Plut. 1.56. L’illustrazione del Nuovo Testamento nella Siria del VI secolo, ed. M. Bernabò, Roma 2008.